The air was still very cold in the morning, so when I sat up to eat breakfast, I put the hood of my down jacket over my hat. None of my layers, including my down jacket offered much in the way of warmth, which made me worried about how I would fare in Washington. But what additional layers could I add? Puma walked by while I was sitting there, happy as usual. I asked him if he had camped in that nice little spot in the trees and after pausing for a moment to think, he said he had. I knew it! Neither one of us had made our mileage goal yesterday. It was good to know I wasn’t the only one. He commented on my nice view and then disappeared down the trail. 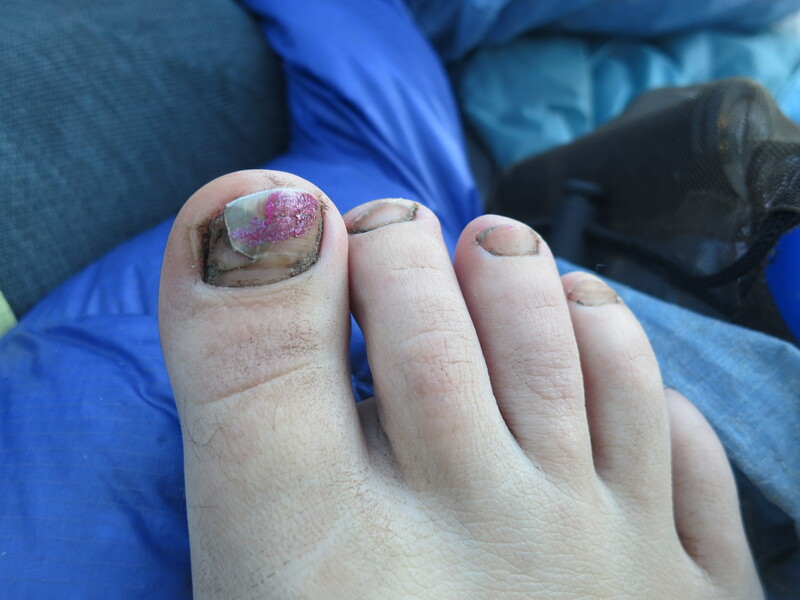 I took a look at the toe that had lost half of its nail. Half the nail? What was I supposed to do with that? It had started to lift off, so I cut part of it away when I was in Bend. I was going to be quite the sight at this wedding with my extreme tan line, missing toenails, and uncut hair! I packed up and headed into the woods. Before long, I started seeing artistic signs on pieces of cardboard, announcing trail magic at Breitenbush Campground. They seemed to be offering non-breakfast food according to the signs- Cuban sandwiches and beer. I had also read that there were outhouses, which I was more interested in (unless the people at the campground were giving away toilet paper, too!). After I had declined the offer of more toilet paper from the nice men, I realized that had been a mistake, as I was running out! 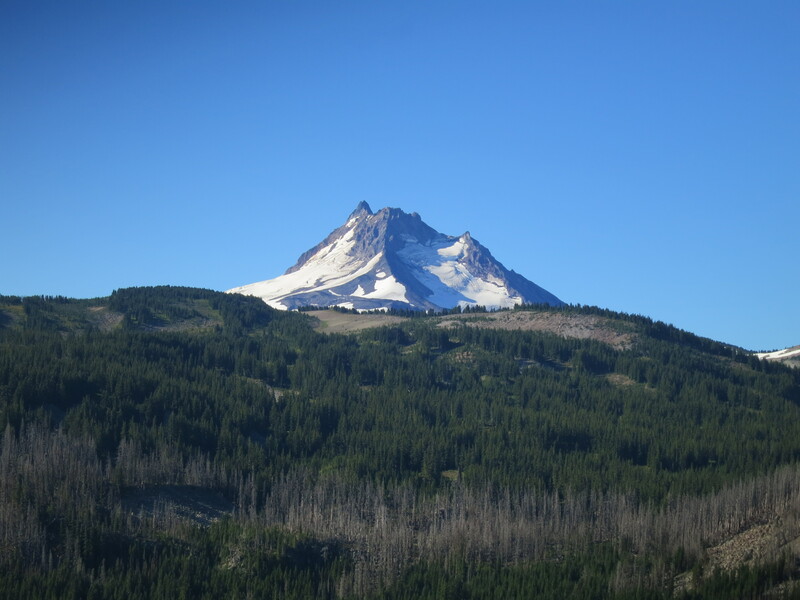 And I still had 60 miles to hike until I got to Timberline Lodge. I found the dirt road that lead away from the PCT and to the very smelly restrooms. Fortunately, there was a lot of toilet paper in there, so I rolled some up to take. Everything was okay once again. I headed back down the road and saw another sign for the trail magic. I reached another road and looked around, but saw no one. I had no idea where it actually was. I decided I would head away from the PCT and walk up the gravel road for a few minutes to see if it was close by. I didn’t see anything or anyone, so I turned back. Ollalie Resort was coming up in a few miles, and I was looking forward to getting breakfast there and didn’t have time for this extra stop anyway. As I walked, I imagined sitting in a restaurant, drinking coffee and eating an omelet, or maybe some french toast as well. I tried to walk quickly in case they stopped serving breakfast on the early side, but didn’t arrive until a little after 11. It took me some time to find my way to the store. 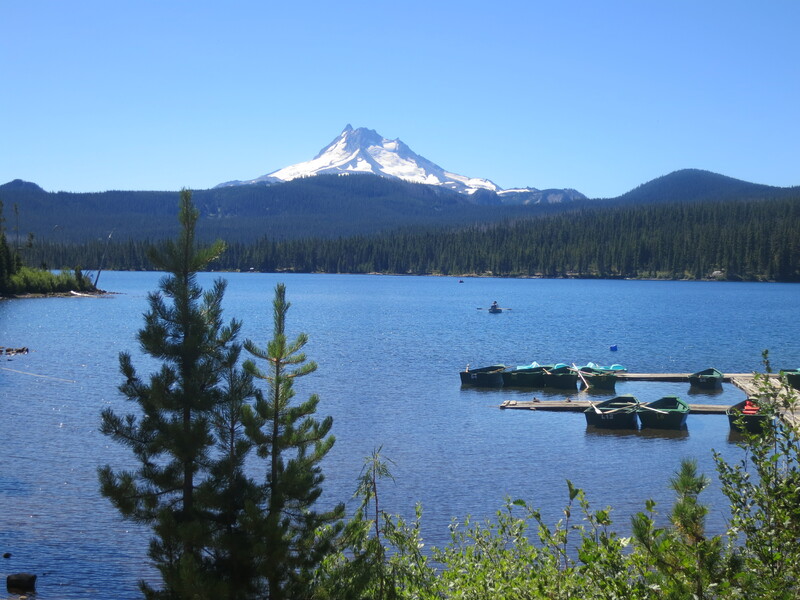 When I walked in, I saw a very small selection of processed food, which made my stomach turn, and then found a little area in the back where PCT hikers could buy things such as a cup of coffee with powdered creamer. I asked one of the employees if there was a restaurant here and I was told there was not. I didn’t want to buy anything, so I went to the porch and decided to eat out of my food bag. Sam continued her story by telling me that she felt so badly about making the guys miss their goal of getting to Timberline Lodge in time for the breakfast buffet, that she figured out where they would be based on their pace and miles per day that they were hiking and drove to a road twenty miles ahead with a huge bucket of Kentucky Fried Chicken. Five minutes later, the first hiker arrived! I told her she was amazing! I packed up my things and headed back to the trail. Although I wasn’t able to eat the breakfast I had imagined, use a restroom, or fill my water bottles, I was able to throw out my garbage (always appreciated!) and was given some nice treats. 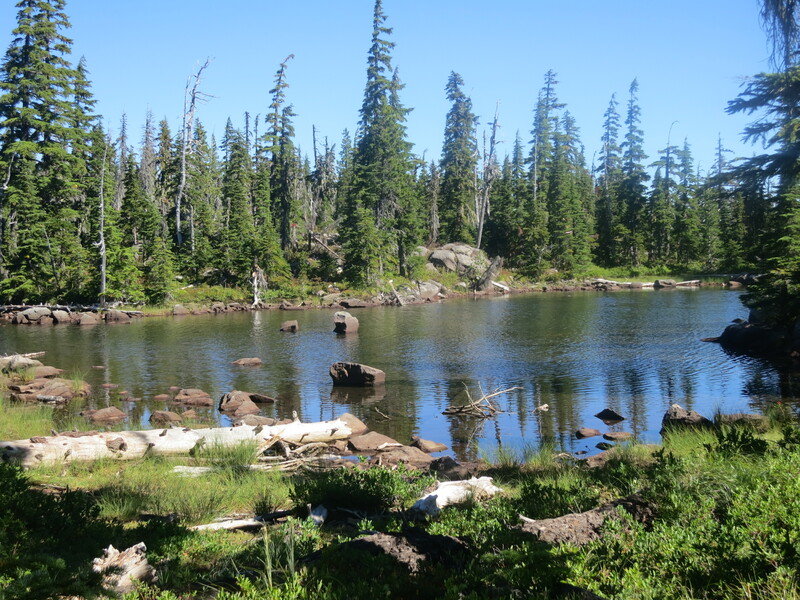 I headed down a short path to a pond, where I collected water. While I was there, a couple that I had seen breaking down their camp arrived to do the same thing. They told me they had met Puma in the morning. He did not stop at Ollalie. As varied and interesting as the terrain was yesterday, today it was mostly forested. 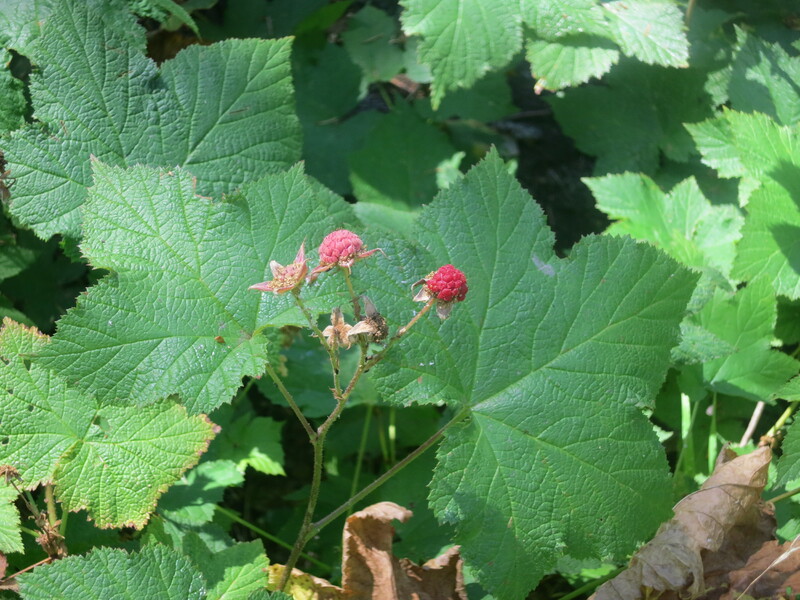 I saw another patch of thimbleberries and picked a few more berries, but mostly, I plodded along, thinking about what I needed for my Washington stops and when. I also worried about whether I had enough toe socks back home to last me the rest of the trip. While they are great for preventing blisters, they get holes very quickly. I had asked my resupply people to check my remaining boxes and let me know which ones contained socks, and how many extra pairs I had remaining, but for some reason, this request was not being met. Instead, I was told to duct tape them! I was also struggling with one of my poles, which kept collapsing every time I put any weight on it. As I walked, I had to continually lengthen it back out. It was particularly problematic in the fords yesterday, as I only had one reliable pole. In the evening hours, I noticed that I had the tiniest bit of reception and tried texting my resupply people. Unfortunately, it wasn’t able to go through. I set my pack down and was going to pee when I saw a hiker approaching. It was Tumbleweed! “How did you get behind me?” I asked. I decided to use the break to take a Starburst out of my hipbelt pocket and eat that instead. He told me that he had gone to the trail magic and ended up camping with them. This morning, they were fed an incredible breakfast! Only he and two other thru-hikers were there. I told him that Puma was ahead and he said, “I know! I’ve been following his tracks!”. I’m amazed that people can tell where their friends are by their shoe prints! He headed on and I tried to pee for a second time. Then, I saw two more hikers approaching! What was going on? Where were all of these people coming from all of a sudden? I did not recognize this couple. I was aiming to get to the river, but Tumbleweed said he was probably going to stop at the spring just off the trail before the river. I began to grow more and more tired, but somehow, I seemed to be able to keep up a decent pace, as I could see Tumbleweed and the other couple ahead of me. We introduced ourselves when they sat on a log to take a break and snack. They also said they were planning on getting to the river tonight. I walked and walked through the forest, and at one point, heard the laughter of two guys off to my left. I smiled, knowing that Tumbleweed and Puma were now reunited. I never saw the path that they took to the spring. Right before I reached the creek, I saw a Big Agnes tent set up in a nice area. The people were already inside. I wondered who it was as I walked by. I decided I would see what was available on the other side of the creek. After I crossed the narrow bridge, I saw more tents and people! This area was even more crowded! Someone asked me if I was looking for a spot to camp and told me there was room. I ended up claiming a spot next to a green tent and was concerned about the lack of privacy, given my problem. 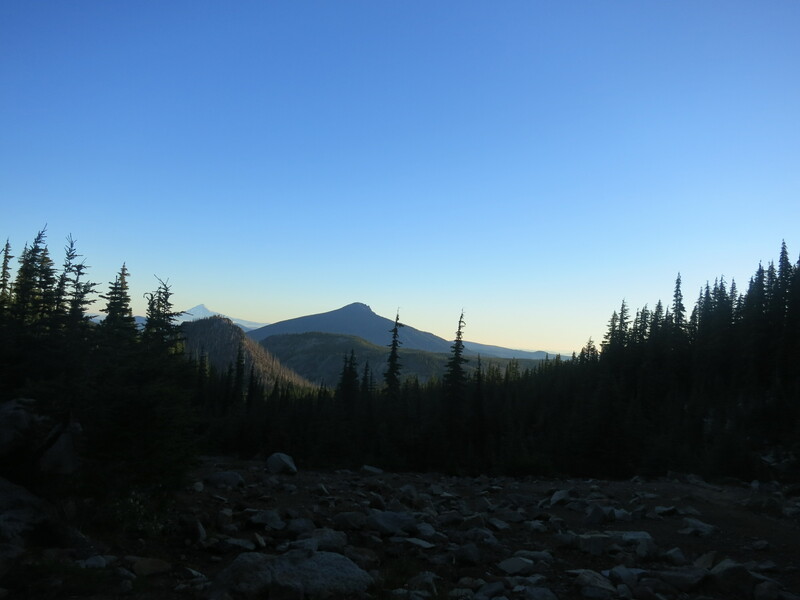 I spread out my cowboy camp and then went to collect water, filter it, and boil my pasta as the sun disappeared. I was invited to join the group of people around a fire across the way, but was too exhausted to socialize. I just needed to lie down. I felt completely and utterly spent. They couldn’t believe the number of miles I had hiked today and completely understood. All of them were hiking the 200 miles of Oregon that Connie had planned. The other thru-hiker couple then came in, looking for a spot. They had to set up their tarp two times to make it fit. I learned that they had hiked 31 miles today, beginning with the snowy section! In the middle of the night, as I tried to sleep, an animal ran around my head, frightening me and not allowing me to rest. I’m pretty sure it was a chipmunk. 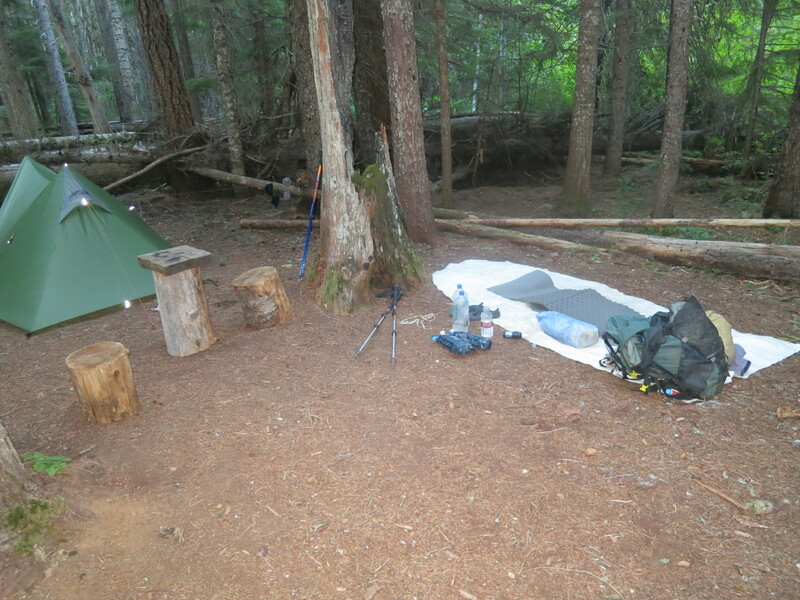 This entry was posted in Uncategorized and tagged Pacific Crest Trail, PCT, PCT 2013 blog, PCT thru-hike by Wendy. Bookmark the permalink.